If you're a pet owner I'm sure you've had the same struggles like the rest of us with bugs getting into our pets food dishes outside. And from there it seems like they never want to eat out of it no matter how small the bug. Which to me is funny when they live outside and probably drink from puddles! But as a pet owner we like to make our beloved furry friends as happy as we can so we try our best to do things to show them love. 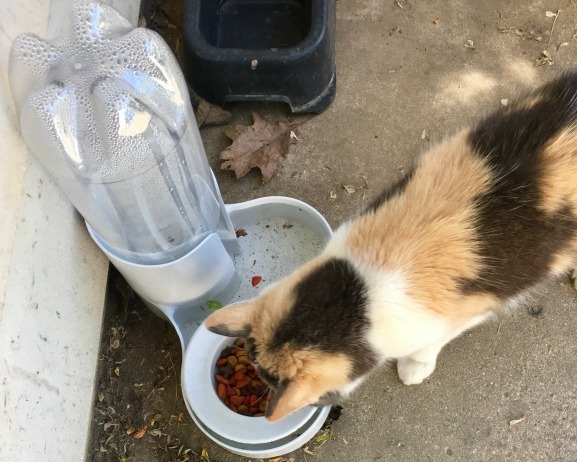 One way would be through the use of a Bugout Pet Feeding System. When I first heard about it I though it was such an awesome invention. A way to keep those pesky ants from invading my sweet Anna's food bowl. So I was happy to be able to give it a shot for her sake. Upon arrival I was really impressed with the quality of the Bugout system. It has a very nice quality construction to it and even came with the 2-liter bottle needed for water. I like that the bowl itself can be taken off the base so you can wash it. Plus the larger bottle is great for those times it's super hot out and you want to make sure your pets have plenty of water. It all started out pretty great using the dish, and I will note to date we've been yet to see a single bug in Anna's food dish! The only issue so far is blowing debris getting into the water portion. We live in the country so there are lots of trees all around and even putting it up next to our house under the overhang hasn't kept the stuff from blowing into it. I'm thinking my next step is trying the carport since it's even more sheltered. I don't want to give up because Anna is really loving her new feeding system. The Bugout Pet Feeding System comes in two sizes so it's great for all sizes of animals. I used the smaller one for her and plan to use the larger one for our dog when she's outside more this summer. I was going to try it with our goats, but they have a nasty habit of knocking over everything and chewing on anything made with plastic. I may even get a second one for our pet rabbit because it would be great for when we take weekend trips. 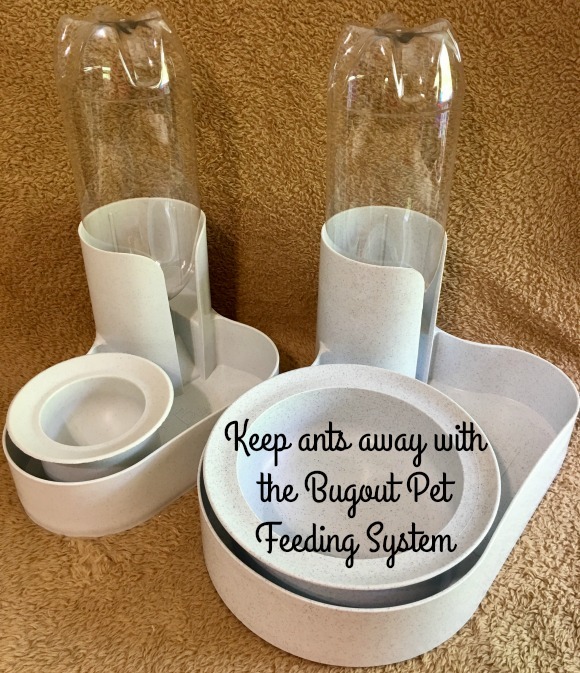 With a novel design and environmentally-safe materials, the Bugout Pet Feeding System keeps ants and other unwanted pests away from your pet’s food. All-in-one design makes the unit more compact than two separate dishes, ideal for travelling, and the sturdy design means your pet’s food and water stay in place. You can take comfort that anywhere you use the Bugout your pet will have fresh food, fresh water, and no ants. The idea came to John Newman of Simply Innovative Products when he kept finding ants crawling around the food dish for his beloved dog Frank. The solution is Bugout, an intelligent feeding system that consists of a self-watering dispenser and an anti-ant bowl. Through ingenious design, the watering system surrounds the food bowl, preventing ants and other insects from infesting the pet’s food. This design, completely free of pesticides, makes the system completely safe for animals and their owners while keeping unwanted ants out. Buy it: Bugout is now available for purchase online at Amazon.